Change Your Mindset and Free Yourself From Negative Thoughts — The Busy Bee Productivity Coaching, LLC. I'm super excited to share some wisdom with you today, and I'm going to be talking about something we ALL struggle with on a daily basis. As I sat down to type up the blog for this week, this topic was on my heart because I am working with a client who wants to change her mindset. We had such a powerful coaching session on Sunday about how our thoughts have brought us where we are today, and they will also lead us to our future. If you are unhappy and want to make a change, the very first thing is to change your mindset. As I always say, productivity coaching isn't all about time management and constantly hustling to get things done. We can't be productive if we're not positive and passionate about our lives. The only way to do this is to become aware of your limiting beliefs or negative thoughts that are holding you back. 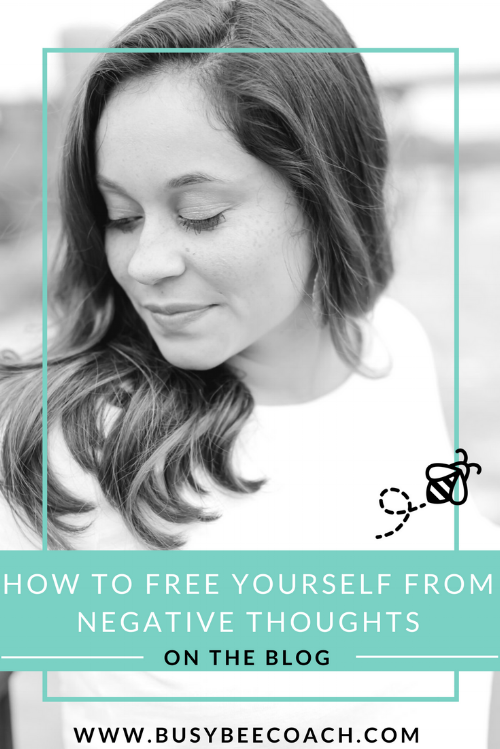 On the blog today, you'll learn about your negative thoughts that are holding you back from things you want in your life. It could be holding you back from taking action steps towards your goals, being fulfilled in your friendships, pursuing a passion, or finding the love of your life. We all have negative thoughts, and things we tell ourselves every single day that we know we shouldn't. It could be about your job. Your body. What you think you're not good at. Things that start with, "I'll never be able to" or "I just can't." Psychiatrist Daniel G. Amen has named the limiting thoughts we say to ourselves every day, ANTS=Automatic negative thoughts. Just like ants, they can ruin the experience of your life! They are annoying, but you can't do anything about them. You just get rid of them, and keep doing what you're doing. That's exactly how to handle your negative thoughts! View them as something that's natural, part of our human condition, and evidence of your growth. Become aware of them. When you find yourself saying something negative, take note! Next, shake those negative thoughts off and stomp them OUT! Finally, replace them with more positive and affirming thoughts. During my client sessions, we create affirmations together that are helpful when ANTS pop up throughout the day. I will create a blog post about affirmations in the future, but basically, affirmations are positive thoughts that replace the negative ones. If you constantly say something like, "I can't speak in front of people" that is obviously a negative, unproductive thought. If you decide you want to change that thought, create an affirmation. Visualize yourself standing in front of a room of people and giving a powerful speech. Say to yourself, "I am a talented speaker and am able to change the lives of others through my confidence and speaking abilities." The more you say it, the more you believe it, and if you believe it, you can achieve it. Stomping out those ANTS and changing your mindset is a sure fire way to a healthy productive mindset. You owe it to yourself to free yourself from these limiting beliefs. Limiting beliefs come from fear, and fear only holds us back. As I type this blog post out to you, please know that because I am blogging about this, doesn't mean I'm perfect at it. I still struggle daily with negative thoughts about my job, my body, my relationships, and everything in between. I just don't let it overtake me, because I am conscious of it, and I have seen the benefits of freeing myself from these negative thoughts. If you found this blog helpful, please share it! My mission is to empower and help women who might need to hear this today. As always, if this post spoke to you, and you'd like to learn more about changing your mindset, or creating affirmations, I'd love to hear from you! My new clients get a free assessment and initial consultation to see if we would be a good fit! You can schedule your consultation by filling out the form below. I can't wait to hear from you!